So I've started the basing for the Bloodthirster Bloodbath project. As far as theme, it's going to be an urban look with dirt piles and debris on top of broken up marble floors. To build the dirt piles, I use something called Creative Paperclay. 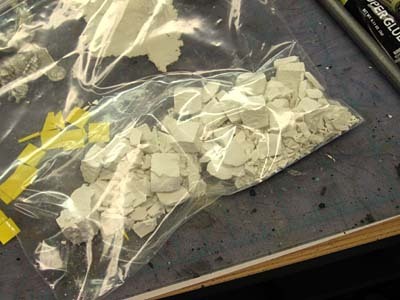 It's an air drying clay that is lightweight and dries hard as a rock. It's fairly cheap, coming it around $5 for an 8oz block of the stuff if I remember correctly. On this project I used about 1/4 of the bag. Once you open it, you'll need another bag to seal it back up in or it'll dry out in no time at all. Even sealed up, it only has a shelf life of a couple months once you open it. 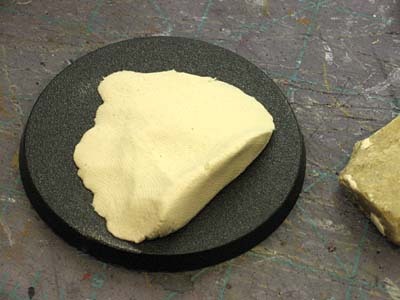 The first step is pulling off a chunk of the clay and shaping it with your fingers on your base. Once you have the general shape, you can go back in with some rocks to add the real texture and get rid of your fingerprints. And here they are finished. As the clay dries, it will "pop off" the base. This is perfect because you flip the clay over and let the underside dry completely. After it's dry, you can superglue it to your base in the exact position you want. 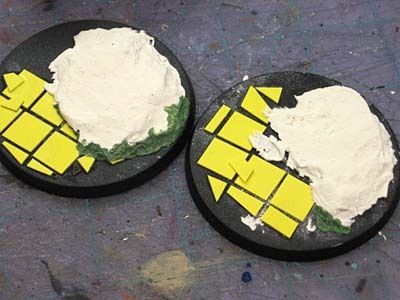 In my case, I'll be adding some plasticard to simulate marble stones and then some debirs to give it the look I want. With the dried clay pulled off the base, I can go back in and add the plasticard without any problems. The greenstuff is used to fill in any gaps left over when I glue the clay back down. Sometimes, if you use a large chunk of the stuff, it might warp slightly when curing. Once I decide on the exact location of the model and drill the hole to pin him with, I'll go back and add my smaller debris in key locations. I use a mix of sand and other stuff I collect to give me a variety of texture. The debris is nothing more than Hirst Arts blocks that have been broken into smaler pieces with a hammer. Glue everything down and it's ready for paint. Cracking post mate, I have a friend who mixes up plaster of paris with clipings of wire and grey paint on a cooking tray. He then smashes it up and it's ready to be glued straight onto his cityfight scenery. 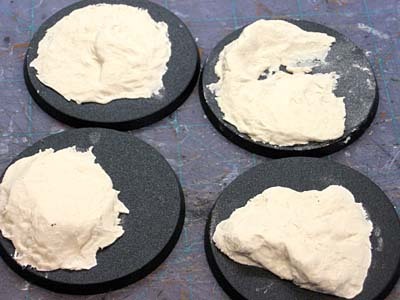 I would like to see how it all looks once you mix the different types of basing materials. As i have been recently introduced to the wonderful world of paperclay. It is lightweight and easy to use, it interests me to see how the harder chunks of debris will look/work. Col: Unfortuately, the Hirst blocks were given to me already cast, but I've heard of mixing color into the process so that if something chips during play, you don't need to repaint it. Steve: Absolutely, I'm building the test model now and will end up painting him completely so I'll him to show the results. You can mix food dye with the dental plaster when casting blocks using the Hirst molds. The dental plaster I used chips if its mishandled, but on a base its not likely to come into contact with stuff that can chip it. Thanks for the tip on the Paperclay. I've been struggling with finding a material that would make a suitable "base" material for some terrain projects I have. I hate to mount things on flat MDF. 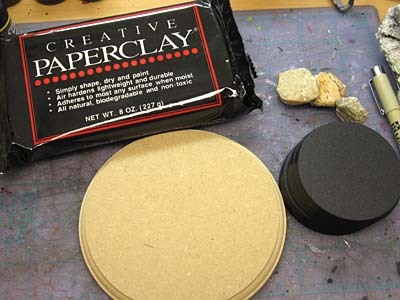 Adding this paperclay on top of the MDF might be the perfect solution. I've used two part expoxies in the past (like Fixit Sculpt) but that always seems too expensive for the amount I've used. I've also tried sculpy but that becomes a pain as I have to "cure" the polymer. It seems like Paperclay may be perfect for me. I'm looking forward to trying it out in the next few weeks.